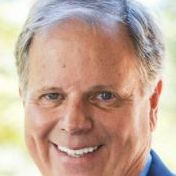 Doug Jones is the Democratic nominee in the U.S. Senate special election in Alabama. "In a 2014 case involving a man convicted of abusing two underage girls, Judge Roy Moore disagreed and wrote the dissenting opinion." Says Roy Moore "has advocated getting the federal government out of health care altogether, which means doing away with Medicaid, which means doing away with Medicare." Doug Jones opposes Trump’s border wall, but there's no indication that he is against other border security measures.